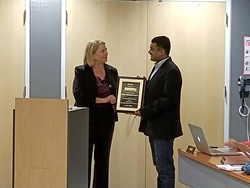 Leading global construction and facilities-related services firm, Gilbane Building Company, was recently honored with the Statewide Educational Wrap-Up Program (SEWUP) Safety Award for overall safety performance on the West Valley Mission College Main Building Replacement Project. This is the highest safety honor awarded by Keenan Loss Control. The new main building at Mission College took 27 months to construct. The Gilbane team worked closely with the college and district to mitigate disruption of campus life.